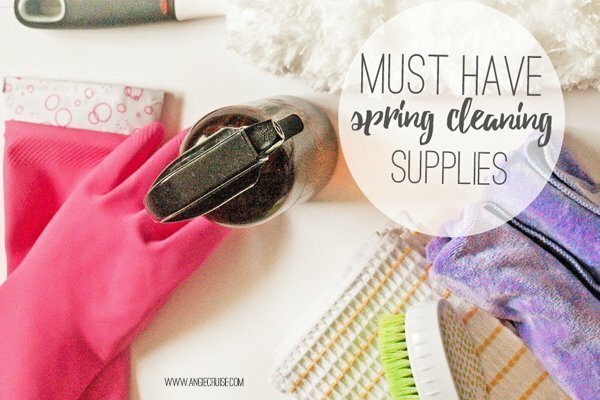 Looking for some all natural spring cleaning supplies this year? I’m rounding up all of my favorites so you can clean your whole house without a single worry! It’s finally spring! You know what that means. This week, we’re sweeping away the dust bunnies and scrubbing the baseboards. It’s time to make the whole house sparkle so we can stress a little less about housework as the weather gets nicer. So, as a mama, I’m always wondering: What are the best spring cleaning supplies to buy? Ever since learning about what’s in a lot of our household products, I’ve been on a mission to detoxify, and spring cleaning is no different. I don’t want to scrub my house down with harsh cleaners that cause respiratory problems for my family to breathe in. I don’t want to clean my counters with products labeled “unsafe for human consumption” and then fix dinner on those same surfaces later the same day. So, what’s a girl to do? Luckily, we have lots of options, and now is a great time to start preparing your products and supplies. Want to overhaul your spring cleaning supplies before you start scrubbing? I’ve got you covered. Here’s what you’ll need to get started. First, you need to get organized. 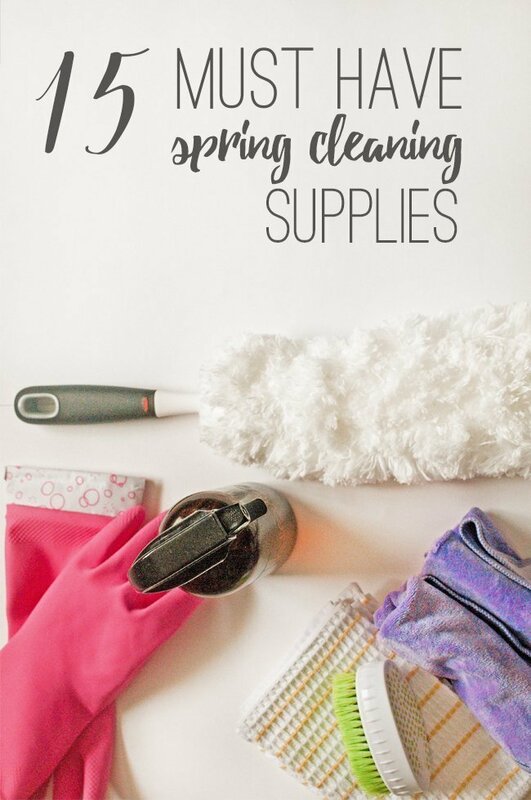 Have you grabbed my spring cleaning checklist? If not, you can get that right here. It’ll be a helpful guide for room-by-room cleaning so you know you don’t miss a thing. Then, you’ll want to get a cute bucket or caddy to keep your supplies in. I love keeping everything handy to carry from room to room. Plus, this makes it easier to store. Simply stick everything in a closet until it’s time to clean again, and you can pull the whole thing out without hunting down your supplies all over the house. One of the best things about using natural cleaners is that it keeps your supply list short and simple. When you have cleaners that can do multiple jobs, there’s less need for extra supplies! It keeps the cost down, and makes it easier to organize. 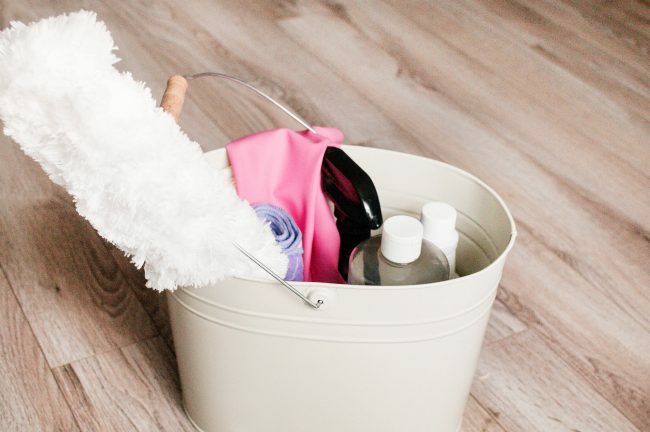 Cleaning caddy: to tote all of your supplies in from room to room, and store them when you’re done. Microfiber cleaning cloths: for dusting especially, but they are also great for mirrors and windows since they leave to lint and no streaks! Dusting wand: for air vents, blinds, ceiling fans, etc. Gloves: These are optional, but I like to use them for grimier areas, like the bathroom. Carpet Cleaner: I don’t personally have my own carpet cleaner, because we only have 2 bedrooms with carpet, but you might want to own one if you have a house full. Another good option is to rent one when you need it! Scrub Brushes or old toothbrushes: Personally, I like to keep both on hand. The toothbrushes are perfect for small spaces like tub caulking and air vents. The scrub brushes are great for sinks, tubs, and grout! Now that we’ve gathered all of our supplies, it’s time to chat products! We all have our favorites, so feel free to use those. I’m going to share my favorites here, though, in case you want something new to try! Thieves Household Cleaner: I use this as the base for just about all of my own cleaners. It smells amazing, is plant based, cleans so well, and it’s safe enough for my kids to help me scrub. Win! White distilled vinegar: If you don’t want to use Thieves, this is another great base for your cleaners. It smells a bit strong, but it’ll calm down once it dries! Hydrogen Peroxide: This is awesome for disinfecting. You can either mix it into your cleaners, or for really tough jobs, put a spray nozzel right on the bottle. Essential Oils: This is a personal preference, but we love using them in our cleaners. Not only do they make everything smell amazing, but they also have added cleaning benefits! Our favorites for cleaning are citrus oils (orange, lemon, and citrus fresh), Thieves, and Purification. Want some DIY cleaning recipes? You can find my favorites right here! There all quick and simple to make, using the ingredients I have listed here. 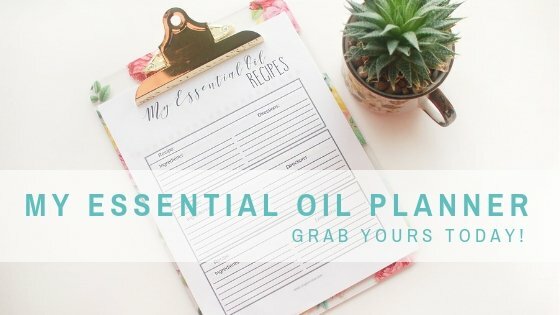 You can also grab My Essential Oil Planner, which has recipe cards for all of your favorite cleaners, so you can keep them all in one place! Are you in spring cleaning mode? 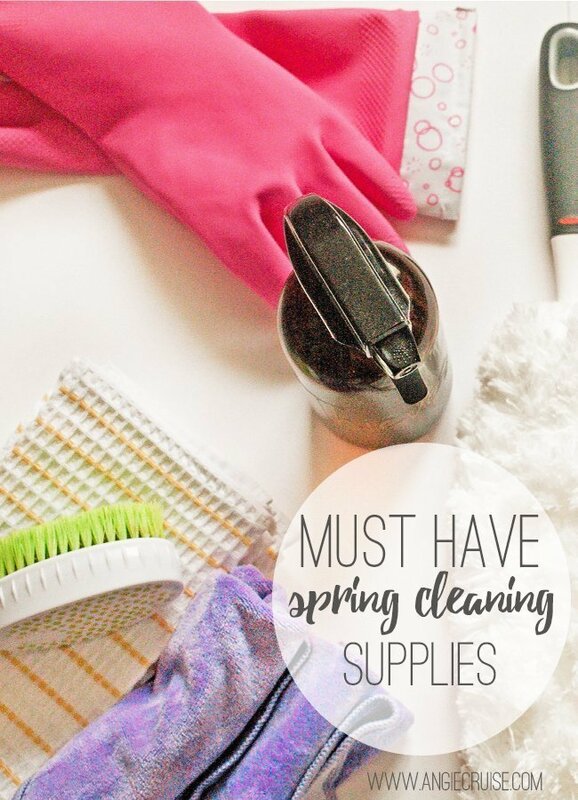 If you’re getting ready to get your house in tip-top shape like me, these all natural spring cleaning supplies and tools are my top picks! What are your must-haves? For this post, I have teamed up with some other awesome bloggers to help bring you even more spring cleaning and decluttering tips. You can find those here! Organize Your Essential Oil Cleaners & Recipes! Angie, you have an awesome list of resources! I like to think of spring cleaning as detoxifying the house. When you get rid of dust and clutter that accumulates in the winter month, it gives everything a healthy boost. This is an amazing list! I’ve been working really hard on getting chemicals out of our home since my daughter has asthma. Thanks for your thorough run down of all the supplies I’ll need… I’ll be using it as a check list to get my Spring cleaning bucket ready. I especially like that all of your ingredients are non-toxic. I also have been slowly transitioning to more green cleaning products–especially because I get my children to help me, too! Angie, your own list is awesome. I am so firm believer of going green. Thank you for teaming up with us! I love the way you explained things.